One of the scores in my recent HWEP with vdubyajohn, this MBX Dodge Magnum wagon is from 2009. The casting first appeared in 2005 as a Police vehicle with lightbar and subsequently appeared both with and without the lightbar and also as a woodie with surfboards as featured here. The 1:1 vehicle was a badge-engineered wagon version of the Chrysler 300. It was discontinued in 2008, marking the end of the last midsize American wagon. So yeah, another station wagon come and gone thanks to crossovers. How about the casting? It’s a nicely detailed casting that does a good job capturing what I’ve always felt was a pretty decent looking car (especially as a cop car). On this particular iteration, the woodgrain tampos on the side mean no tampos on the front/back, which is kind of unfortunate, as the front especially could really use something to break up the sea of red. There are other versions with front/rear tampos. This is exactly the kind of casting we want/expect from MBX - a nicely realistic stock version of a real car. 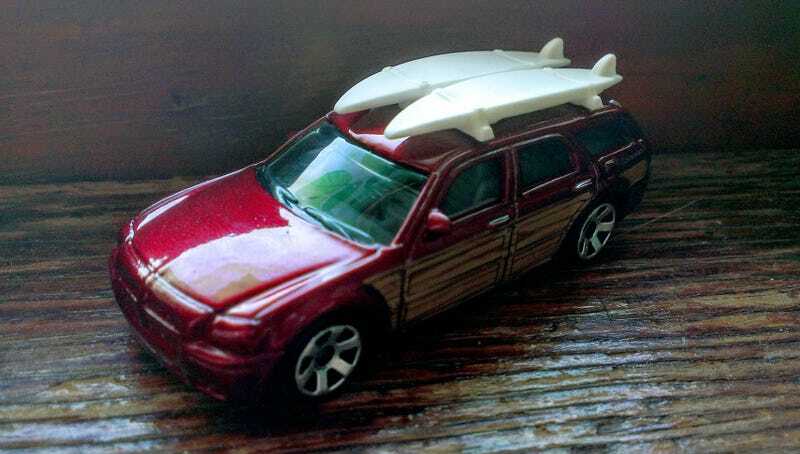 The woodie/surfboard combo is a slightly odd choice, but it appeals to me as the owner of a station wagon with fake woodgrain panels.